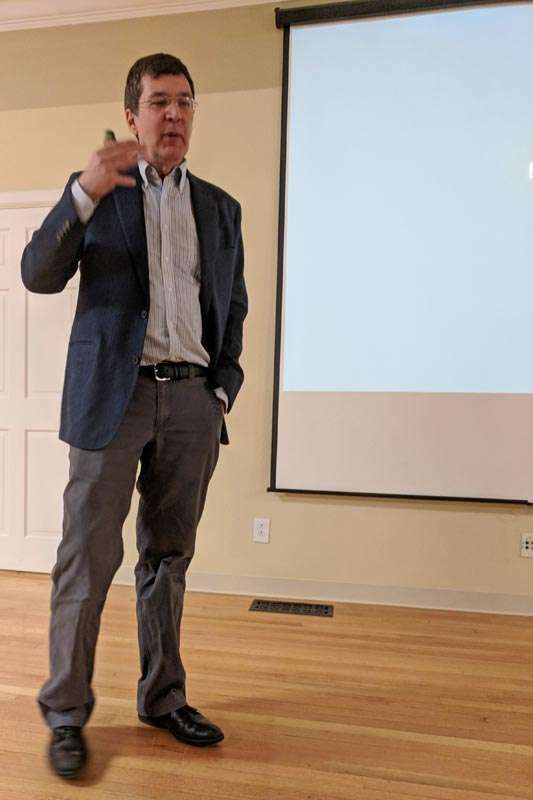 Paul Swanson, M.D., director of the emergency department at Eastern Plumas Health Care, presented an in-depth look at the opiate crisis from origins to present-day, at the EPHC Education Center on the evening of Feb. 21. Swanson shared a tweet from President Trump in October 2017, which declared the opioid crisis a national public health emergency under federal law. Swanson then moved to a graph, which showed the trajectory of drug overdose deaths in the United States between 1980 and 2016. Swanson then showed a slide showing overdose deaths per 100,000 in the U.S. between the years 2003-2014, with the maps illustrating the rapid growth of drug overdose deaths over the years. Swanson went on to note that current heroin users are most likely to be white, middle class and live in suburban or rural areas. “It’s the same population that has a rise in the abuse of opioid pills,” he added. Swanson noted that between 2000 and 2015, one-third of overdose deaths were from prescription opioids, such as morphine, oxycodone, hydrocodone or methadone; one-third of overdose deaths resulted from the abuse of diamorphine, which is also known as heroin; and one-third of the deaths were from fentanyl, which is a street drug that is 20 times as potent as heroin. “There had been a lot of pressure on doctors to prescribe opiates,” Swanson went on, in describing the turning point that he feels led to the current crisis. “This is a key point — this crisis has been caused by doctors over-prescribing opioids. The key thing that I want to get across here is also that the overprescribing has caused the illegal drug use,” Swanson said. Swanson followed the statement with a slide showing a letter that went out to all doctors in August 2016 from the U.S. Surgeon General. A key part of the letter reads, “It is important to recognize that we arrived at this place on a path paved with good intentions. The room was silent as the audience absorbed the statement and Swanson moved on to the next key item, which was in fact the marketing aspect that assisted in creating the crisis in our society today. According to Swanson, America has the largest drug market of any country, with $300 billion spent on prescription drugs in 2009, and $215 billion spent on illegal drugs in 2012. “So America’s illegal drug market is essentially two-thirds as big as the prescription drug market,” Swanson stated. Swanson also noted that the U.S. has the highest annual drug trafficking revenue in the world, at an average of $215 billion, followed by Spain at $95 billion and Italy at $83 billion. Swanson stressed the fact that it is easy to be prejudiced about the types of people that use heroin. “It really can be anyone,” he stated. When it comes to the circle of addiction and the next generation, Swanson highlighted some statistics from the DEA, which show how prescribed opioids such as oxycontin cost $80 a tab, and hydrocodone is $5 to $7 a tab, with heroin at $5 to $10 a bag. One example was a post from San Francisco from Feb. 12, which listed a 5 mg oxycodone pill at $20 on the street at that location. 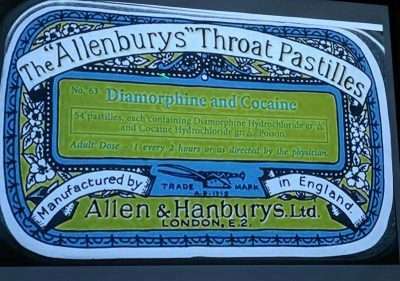 Common household medications included throat pastilles such as these, with heroin and cocaine listed as the main ingredients. Statistics from the National Institute on Drug Abuse show that 4 to 6 percent of those who misuse prescription opioids end up transitioning to heroin. Swanson shared a piece of one opioid abuser’s story with the room, from the perspective of a 51-year-old who had been using heroin for nearly six years, and was originally prescribed percocet for the pain from a knee injury. Swanson then showed photos of the view from the street, with parents overdosing in vehicles as young children watched from the backseat, young people passed out with belts wrapped tightly around their arm, and even a video clip of a Pennsylvania man caught shooting heroin on a public bus and ultimately keeling over and out of his seat onto the floor. Swanson then went over the effects of opioids, which includes euphoria, pain relief, sedation and respiratory depression. An opioid overdose involves respiratory arrest, which is currently combated by drugs such as Narcan, which can reverse an opioid overdose rapidly most commonly through a nasal spray. Swanson went on to explain that long-term use of opiates typically cause drug tolerance issues, where doses must be raised to achieve the same effect; and hyperalgesia, which is, oddly enough, an increased sensitivity to pain in opioid users. Swanson then took the room to the roots of the opium trade, showing images of the opium poppy fields in Afghanistan, and gave a brief overview of opium in China in the 1800s. 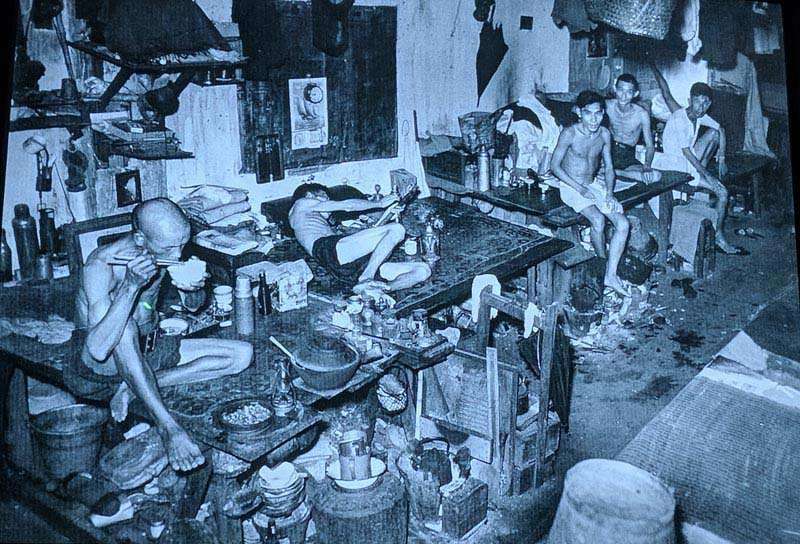 Various images of opium users and opium dens of a bygone era flashed past on the screen, with sunken ribs, lethargy and vacant eyes. The Opium Wars, the two wars that England fought with China over the coveted substance, really changed the global face of opiate use, according to Swanson. Dr. Swanson takes the audience at his recent presentation on a look into the opium dens of days past. Swanson then neatly integrated the conversation into the chemical makeup of opium, which contains 10 to 25 percent morphine and 1 to 3 percent codeine. In 1874, Charles Wright, an English chemist, boiled morphine in acid, creating diamorphine or heroin. Diamorphine was rediscovered in 1897 by Felix Hoffmann at Bayer Pharmaceutical in Germany and officially labeled the drug heroin, which came from the German “heroisch,” meaning heroic or strong. 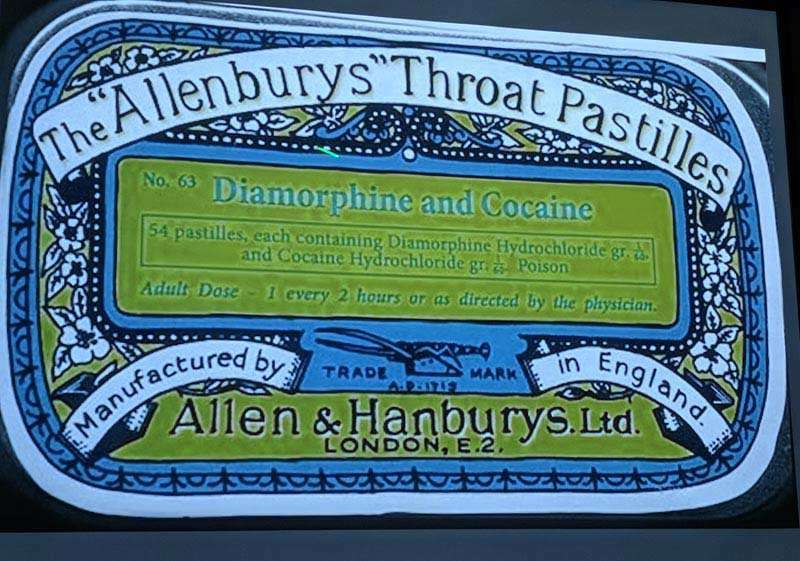 Heroin really entered the pharmaceutical drug industry in the beginning of the patented drug era and could be found in nearly every common household remedy, from cough syrup to pain medication. Swanson gave a brief history of opiate epidemics, beginning with morphine and heroin from the 1880s through the 1900s; noting the use of heroin in the jazz era, and the Vietnam era to the 1990s, where heroin was sourced from Columbia. The epidemic surfaced again on the Sept. 4, 1973, cover of Time magazine, with a headline proclaiming The Global War on Heroin. The statistics speak for themselves, according to Dr. Swanson. Governmental regulation became a factor, and pain itself became the required fifth vital sign in addition to traditional respiration, heart rate, temperature and blood pressure. “This all led to an environment where doctors felt pressured to prescribe opiates — there was a lot of pressure on the doctors, as well as a lot of anxiety felt among doctors about prescribing to avoid complaints,” Swanson explained. Much of this period of anxiety within the medical community evolved from a letter to the editor, of all things. “This became known as the infamous Jick letter, which was cited more than 600 times in publications as evidence that opioids were not addictive. 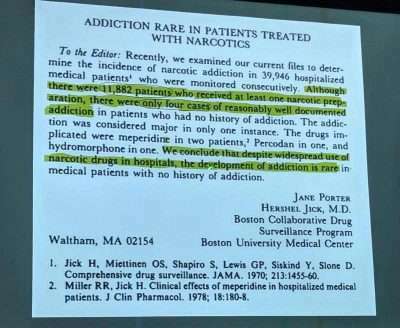 The letter was written by Hershel Jick, M.D., of the Boston Collaborative Drug Surveillance Program, and stated that in one particular study, there were 11,882 patients who received at least one narcotic preparation, and only four cases of reasonably well documented addiction, Swanson said. 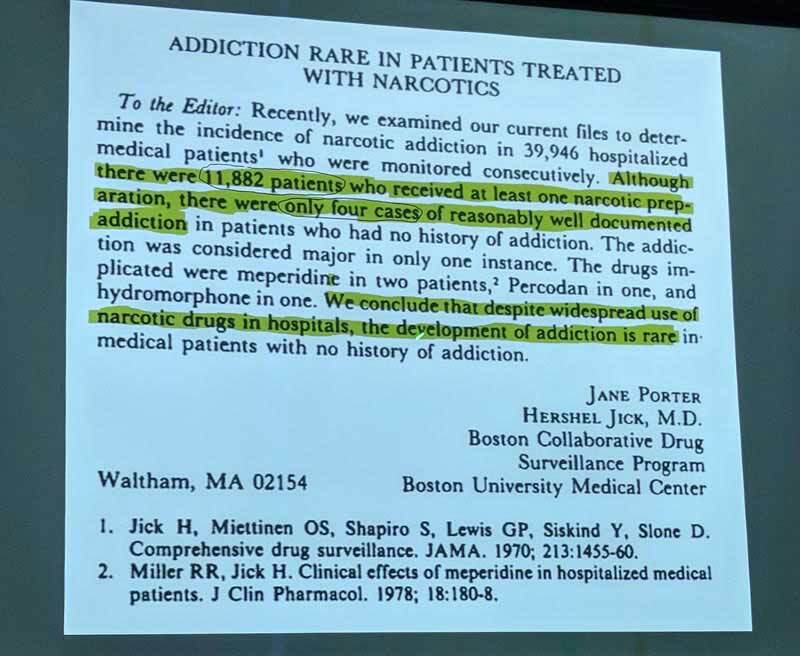 This letter went on to be frequently referenced by pharmaceutical companies marketing opioids as nonaddictive treatment for pain management. Swanson then focused on the Eastern Plumas experience, saying, “Five to seven years ago, there was a great concurrence of opinion on opioid reduction from the EPHC Board of Directors and administration. This is key — if the board and administration agree on this, the doctors were very glad to agree as well because they are aware that the opioid over-prescribing is a problem that needed correction. “EPHC was wonderful and we needed admin on board to ride through the process of tapering opioid prescribing — otherwise we never would have gotten through the process. I certainly see tremendous success thus far in the emergency department, with fewer pain complaints,” Swanson said. Swanson noted the two models of addiction, past and present: The “personal responsibility model of addiction,” which emphasized personal choice and responsibility; and the “biological model of addiction,” which is the current scientific and medical standard. The latter model states that addiction is uncontrollable and that the addict is a victim. Swanson feels that it is time for a new model of addiction, which would incorporate the idea that free will does, in fact, exist as top-down causation from high-level understanding to action.